A dragline excavator is usually used in stripping. 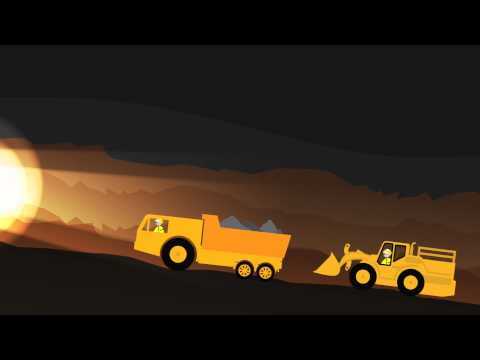 This lecture covers mining and introduces how mining generally is done, what machinery and methods are used and how ore and waste rock travel within the mine complex. Mining is done to liberate minerals from the crust of the earth. This is done in several steps. The steps differ between mines depending on commodity and factors such as composition and quality of the rock, the geometry and location of ore, geology, topology, local environment, legislation and so on. A general explanation of the steps and their different methods is given in this lecture. In the beginning of a mining project the area must first be cleared of top soil to reach the bedrock. This material is called overburden, and stripping is done to remove it. The soil can be used within the mine, for example to construct roads or other infrastructure. To liberate the ore from the ground, explosives are used. The ground is drilled with shallow holes, with are filled with explosives that blasts the rock to pieces. This is called drilling and blasting. The rock is collected by excavators and commonly transported by trucks. To reach the ore, the surrounding rock with lower concentration of valuable minerals must be removed. This rock is called waste rock. The waste rock is transported out of the mine and is often deposited in piles or heaps. The amount of waste rock produced relative to the amount of ore produced is called the stripping ratio. For example, a stripping ratio of 2:1 means that 2 tonnes of waste rock needs to be mined to mine 1 tonne of ore. The stripping ratio depends on several things, such as the depth and geometry of the ore body, the mining method that is used and the composition and stability of the rock. Excavators loading ore and waste rock on trucks. The trucks carry around 150 tonnes. The ore is transported by trucks or a conveyor belt to a processing plant. The processing plant is often located within the mine area, and is used to separate the valuable metals and concentrate them to a product that can be smelted into ingots of metal. The ore is dumped in a crusher which crushes the rocks with mechanical force to smaller pieces, usually the size of gravel. The material is then taken to a mill to further reduce the particle size of the material, producing a fine sand or powder. There are different types of milling. One of the most common mills use large drums with metal balls that grind the material, called a ball mill. Milling is one of the most energy intensive steps in mining, accounting for most of the energy consumption at a mine. Crushing and milling is done to make the next step possible – separation (also called concentration). When the ore is grinded to a fine sand or powder, it becomes easier to separate the valuable minerals from the other minerals, called the gangue minerals. Separation can be done by several different methods. The method is chosen depending on the properties of the ore, such as type of commodity, type of host rock and so on. Magnetic separation is used when there is magnetic material in the ore. The technique takes advantage of different magnetic properties in the ore using large magnets, which makes it easy to separate different minerals. Gravity separation uses the difference in density of the materials to separate them. An example is panning for gold, where the sand from a river is shaken in a pan to let the gold (which is much heavier) sink to the bottom of the pan. The other material is removed with the help of water. Similarly, this can be used in a larger scale using machines such as shaking tables. Using chemicals is however the most common method to process ore. Different chemicals can be used to dissolve metals to a solution, making it an effective way of separation. For example gold can be leached with cyanide, and many base metals with sulphuric acid. A common chemical technique used for sulphide ore containing base metals is called flotation. The technique separates hydrophobic materials (that are repelled by water) and hydrophilic materials (that are attracted by water) from each other. The separation is enhanced by adding surfactants and wetting agents, allowing minerals to stick to chemicals and separate easier. There are also other types of separation techniques which uses other properties in the ore, such as electrostatic separation. After separation, two types of materials are created: a concentrate and tailings. The tailings are a fine-grained waste product, containing the unwanted minerals. Depending on the composition of the ore, this material can contain elements that can be harmful to the environment. Tailings are generally deposited in a tailings storage facility (TSF). This will be further explained in lecture 4. The concentrate often needs to be further processed to be sold to the manufacturing industry. The concentrate can contain a few percent of metal up to 75 percent and over depending on the ore composition, technique used and so on. Processing of the concentrate is often done in a smelter, which uses heat to extract the metals from the fines and burning off other material producing a slag (waste). There are also other methods to process the concentrate, such as using hydrometallurgy or electrometallurgy. As the mining operations cease, for example by diminishing ore reserves or lack of profit, the mine goes through a period of mine closure. This means that the mine is decommissioned and remediated. Remediation of the mine is done to provide long-term physical, chemical, and biological stability of the site to minimize potential environmental and health risks.